Maria Riesch has shown determination beyond the limits to build a successful career, have it all come crashing down, before climbing off her hospital bed twice to reach the top of the world's skiing hierarchy. The German pin-up is a popular figure on the World Cup circuit and is one of the best all-round skiers in the game which should serve her well in a bid for a first Olympic medal at the 2010 Vancouver Games. Born in Garmisch-Partenkirchen, the site of the 1936 Olympics and one of the tallest skiers on the circuit, Riesch will go to the Canadian West Coast as the slalom world champion and holder of the crystal globe in what is her strongest discipline. However it is her lion's courage that may prove the difference and her pedigree as a champion that makes her stand out from the pack after overcoming two serious injuries that threatened to ruin her career. She began skiing as a toddler and steadily climbed the junior ranks to become junior number two in Germany at the age of 15 before four gold medals in four different disciplines at the world junior championships between 2002 and 2004. 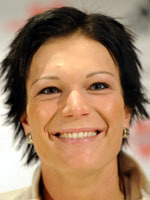 After winning promotion from the German European Cup team to the World Cup squad at barely 15 she finished on the podium for the first time in December 2002 when she took third in the combined at Lenzerheide in Switzerland. That signalled a series of top ten finishes and her first World Cup win in January 2004, when she won the downhill at Haus im Ennstal, Austria. To cap a superb season she finished third in the overall rankings before disaster struck the then 20-year-old. In a super-G race at Cortina d'Ampezzo, she crashed heavily and ruptured knee ligaments to bring her season to a shuddering halt and force her into a spell of 10 months on the sidelines. She was back for the 2005-06 season and broke into the top ten in two races in North America before another shattering injury again at Aspen stopped Riesch in her tracks when she tore knee ligaments in her other leg. She missed the Turin Games and was out of action for nearly a year before finishing on the podium in just her fourth race back in a downhill at Lake Louise during the 2006-07 campaign, her first top three finish for nearly two years. Since then, Riesch has gone from strength to strength and after finishing third overall in 2008, she lit up the circuit in 2009 with five wins, four in slalom which catapulted her to second in the overall rankings behind her good friend, the American Lindsey Vonn. In what was her best ever season, she held her nerve at the world championships at Val d'Isere to win the slalom crown as she now prepares for what will be her first Olympic campaign at Vancouver.